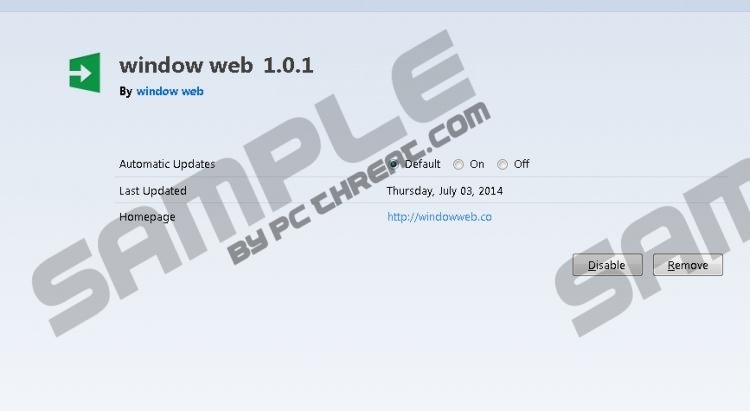 Window Web, also spelt window web, is a browser add-on that you can find at windowssweb.co and on freeware websites. In the latter case, the program is bundled with other free programs, such as browser add-ons and media players. The program is supposed to enhance your browsing experience by proving you with advertisements of different types, including web banners, pop-ups, interstitial advertisements, and in-line ads. All these advertisements belong to certain third parties, which are not monitored and endorsed by the developers of Window Web, which is why we strongly recommend that you remove Window Web from your browsers as soon as you can. Window Web can be employed by cyber criminals that seek to drive more traffic to their deceptive websites and mislead computer users into downloading malware or revealing their personal information. You should not trust Window Web blindly because you cannot know to what website you will be directed by Window Web advertisements, some of which feature the labels ‘window we Ads’ and ‘Powered by windows web’. This insecure browser add-on is developed by SuperWeb LLC, which is notorious for numerous identical programs, including SnipSmart, Grassmow, FlippyRoo, and many other advertising-supported browser add-ons. Window Web randomly selects advertisements and sends to your browser, regardless of the website. You may find pop-ups inviting you to take part in a quiz or survey, play online games, update your Internet browsers or Java player, etc. However, some of the advertisements are likely to be related to your browsing interests especially when you are browsing shopping websites. Nevertheless, we recommend that you ignore Window Web advertisements and remove the browser add-on from the computer because your interaction with Window Web may have unexpected consequences. You should also keep in mind that Window Web automatically records anonymous information related to your browsers and browsing behavior. The browser add-on records clicks, impressions, search terms, browser settings, and other details that can be obtained from your browsers. This information is being recorded for the purpose of providing you with new advertisements, and, if you do not want to receive more advertisements, simply remove Window Web from your browsers. Below you will find our step-by-step instructions on how to uninstall the browser add-on, but we recommend that you install a reputable malware and spyware prevention tool. You should not keep the system unprotected because the Internet is the major source of various computer infections, including Trojan horses, browser hijackers, rootkits, ransomware, etc. We recommend that you implement SpyHunter because this security program easily removes SuperWeb programs and safeguards the system against various threats. In case you have any questions regarding the removal of the program, feel free to leave a comment below. Select the Control Panel options. Click Uninstall a program and remove Window Web. Quick & tested solution for Window Web removal.